Katalon Studio's powerful automation tool-set now has a proprietary integration with qTest for test automation reporting and consolidation. 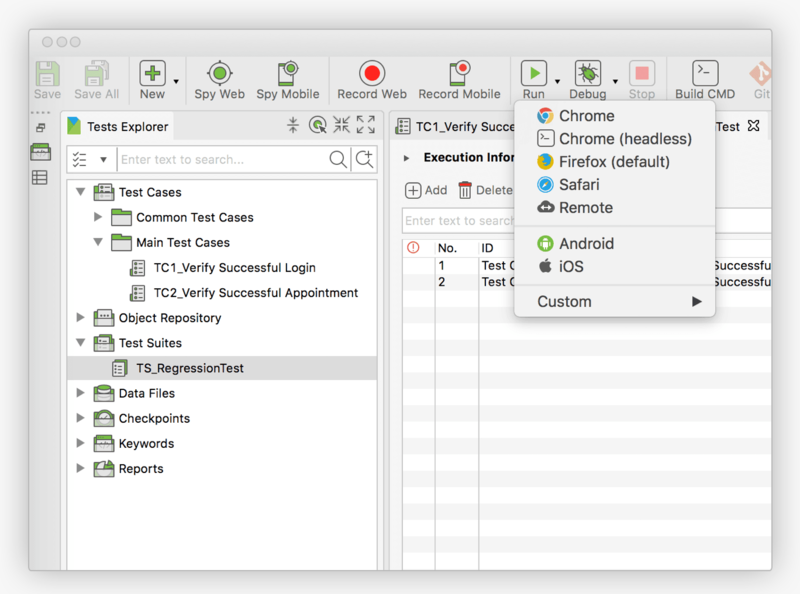 Gain visibility into your browser and mobile based functional automated and API test executions. Contact sales@qasymphony.com for more information. 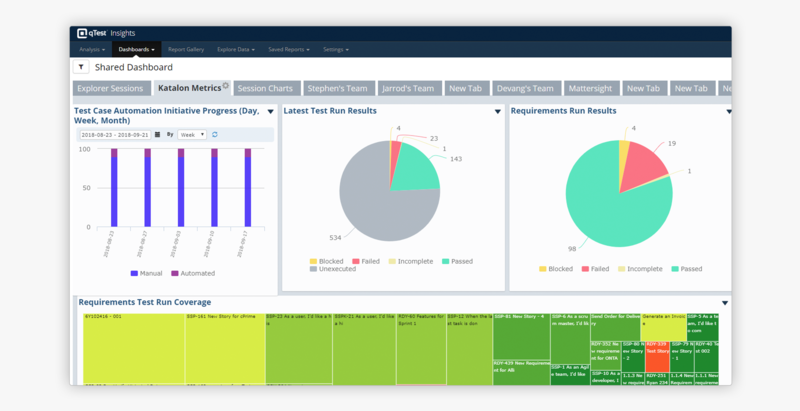 Go beyond standard reporting metrics and use qTest Insights to show executive test automation progress. Associate Katalon tests to Jira issues through qTest Managers real-time integration. 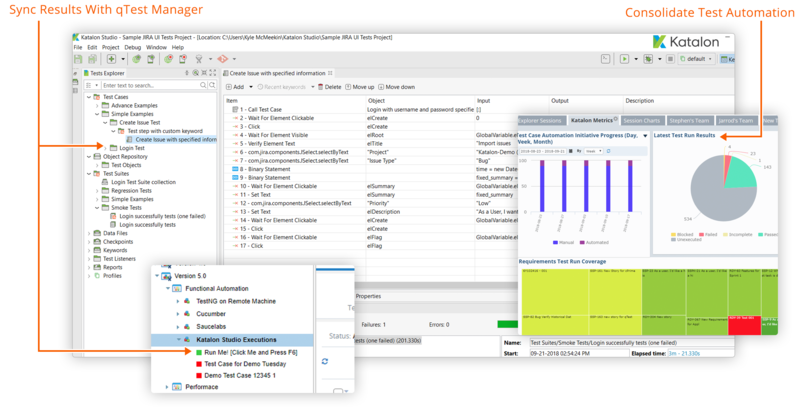 Quickly scale and manage your test automation footprint. Configure multiple qTest projects with Katalon test automation teams. Easily map Katalon test run conditions to qTest Manager. Katalon Studio is a test automation platform that allows teams to easily create, plan, and execute automated scripts for browser and mobile based applications. Katalon Studio helps increase functional test automation coverage without the need of extensive automation expertise to create your scripts. Track automated, exploratory, and manual test executions side by side. By combining qTest with Katalon, your teams will get full end-to-end test automation management across your agile and DevOps life-cycles. "Our proprietary integration with qTest is a perfect match -- it's a combination of the best in test management with one of the most easy to use automation tools on the market." Katalon Studio has an exclusive version built specifically for qTest customers. This version contains all the latest features and an out-of-the-box integrations you need for end-to-end test automation management. Use Katalon’s real-time integration to hook your Katalon projects to qTest in less than five minutes. 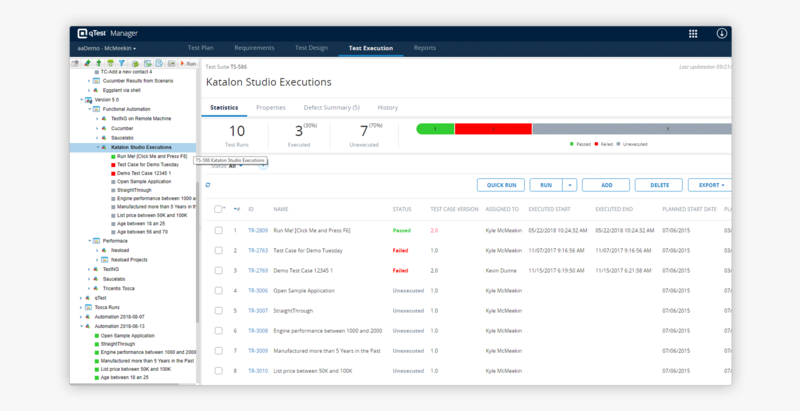 Katalon will send over tests cases, execution statuses, timing, and log files to qTest when your Katalon users execute the tests within Katalon Studio. Aggregate Katalon data with other test run executions, such as Performance tests with Flood or SAP tests with Tricentis Tosca using qTest Insights. Please contact us to purchase this exclusive version of Katalon Studio.